"I am writing to express my gratitude to RaceTech, for the work they performed on my 2004 BMW R1100S. They custom built an emulsion shock for the front ,and a piggyback design for the rear. On its maiden voyage, I went through the twisties of Ortega Highway, and was amazed. Never had the bike handled so competently. My riding confidence was significantly enhanced due to the improved handling and control." "I would highly recommend Race Tech Suspension to any BMW rider." G2-R 25mm Cartridge Kits are a customized and personalized for your forks, providing a firm, plush and consistent stroke resulting in a ride that provides more "feel" and outstanding traction. Made of the highest quality materials, these complete kits come pre-valved and include fine tuning charts. Race Tech Supports Touring Enthusiasts. 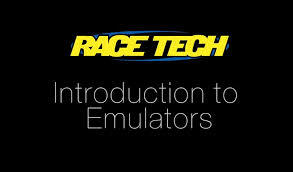 Race Tech field representative Matt Wiley will again be attending the Golden Aspen Rally in Ruidoso, NM Sept 17-121 2014. This Rally takes place in the beautiful mountains of New Mexico at the Inn of the Mountain Gods Casino & Resort. New for the 2014 Golden Aspen Rally is the Race Tech Sponsored Golden Aspen Rider Challenge This exciting event taking place Friday & Saturday is open to all attendees. It will also include and riding clinic hosted by Race Tech Sponsored Rider Reno Birt, Top Gun National Champion. This exciting event takes place Friday & Saturday at the rally. It will demonstrate the amazing riding of Reno and he will be skills coaching riders at the event! Matt will have Race Tech Display at the Vendor Expo and be available to answer questions about your suspension operation and improvement options.Rally specials will be available to attendees! In today's age of high-horsepower superbikes, large-displacement cruisers and super-heavy-weight touring bikes, riding skills are more important than ever for safe, fun motorcycling. Unfortunately for experienced riders, there is a large gap between the Motorcycle Safety Foundation's Experienced Rider Course (ERC) and the many racetrack schools around the country. Many riders are interested in improving their skills but are unwilling to take on the additional risks associated with a high-speed environment. If you fit into the "I'm interested, but" group, you're not alone. 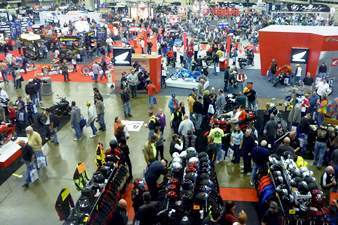 In fact, if you add up all the attendees of all the race schools together, they only represent a tiny percentage of street riders. This is not to say they are not good schools. To the contrary, they have much to offer. But they are not for everyone. Fortunately, Lee Parks' Total Control Advanced Riding Clinic (Total Control ARC) has a solution for those experienced riders "caught in the middle," as well as those track-day junkies and racers who want to be able to further enhance their skills in a controlled environment with expert instruction. ►Read More! Email Matt Wiley for TCARC Tech Support, Orders, Installs. Matt can also be reached at 951-279-6655 ext# 108 during regular business hours MST Monday - Friday. We offer multiple options to improve the F800ST suspension. Most riders find the stock suspension very soft and mushy. Gold Valve Emulators and RT Hi-Performance Fork Spring are available for the Forks as well as a G2-R 25mm Cartridge Kit that adds compression and rebound adjustment. For the rear we have a G3-S Custom Series Shock. ►More Info! I want to express my thanks to everyone at Race Tech for transforming my low suspension BMW f650gs twin to a competent off roader. Other riders were telling me that I could not have the low suspension and decent handling off road --especially at my hefty 230lb weight. Initially they were right, the bike would hop and skip in turns uncontrollably. Then, I got Race Tech involved and the bike was transformed. I would actually describe it as a "spirited off roader". It is controllable, glides over washboard, and stays on line in sand or gravel even at elevated speeds. Further, on top of transforming my bike, your customer service was unparalleled. I was kept informed and every option was carefully explained to me. Quite simply, you guys are the best in the business. Thank you! We've dramatically improved the F800GS suspension! The main complaint about the bike is it's too soft. The suspension does not perform well when pushed, on or off road. Since the stock cartridge is non-revalvable we have G2-R 25mm Cartridge Fork Kit and RT Hi-Performance Fork Springs. On the rear we've developed a G3-S Custom Series Shock that works great. ►Find out More! The R1200GS is excellent. Our goal was to make it firmer without losing plushness. We have a G3-S Custom Series Shock for the Teleleaver front end and one for the rear. There are two versions of the G3-S Shock available for the rear - with and without a remote reservoir. ►Get More Details! 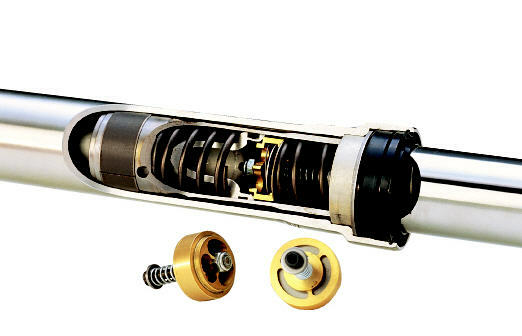 Race Tech is the place for post-vintage and vintage BMW motorcycle suspension. On many models you can transform your suspension just by adding, easy to install, Gold Valve Emulators and RT Hi-Performance Fork Springs. The difference is amazing. We have fitments for many models with telescopic forks. Check our Product Search for components to fit your bike. Springs are the very first option you should consider for improving your handling. RT has over 500 Hi-Performance Fork and Shock Springs. If your bike is not listed in our Product Search, you have questions about applications please Email Matt Wiley Tech Support/R&D.